Live and Uncensored! : Is Monocle the New Louis Vuitton? I’m not sure the people at Monocle would like their well-cared for magazine to be positioned as a luxury product brand — but it’s not always up to the people who work at a brand to decide what the brand is about. Today, many luxury brands feel manufactured and the holding company’s strategy of putting them through a BCG Matrix lifecycle of stars to cash cows must be plainly obvious to any premium product-buying customer. They want more. They want better. Brûlé and his team have not only had the opportunity to write about fashion, travel, automotive and jewelry — they have had the opportunity to create world-leading businesses in each market by leveraging a very 21st century top-of-the-market brand. 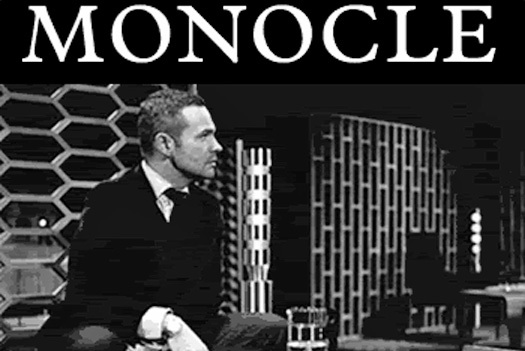 - Piers Fawkes, "Is Monocle the New Louis Vuitton? ", PSFK. I am inclined to agree. It's the information age, and Monocle is a luxury purveyor. You can feel it at first touch; even its ads are a tribute to content.